At least you can’t accuse him of wanting to go it alone. Since September the US has been joined by Australia, Canada, France, Bahrain, Jordan, Qatar, Russia, Saudi Arabia, Turkey, and the UAE in launching airstrikes against Syrian Islamic State targets. 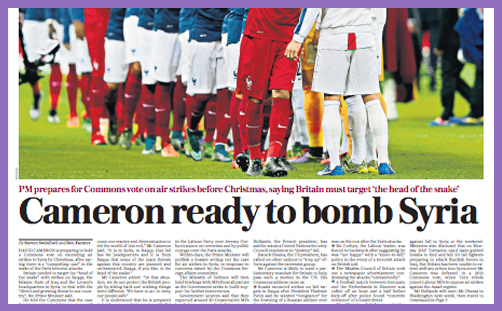 France and Russia are understandably keen to hit Syrian ISIS strongholds right now, and you can’t help but wonder if it had been London rather than Paris that suffered such horrific acts of murder on Friday whether David Cameron would need to be making a case at all. I am shocked by his answer, because this is a man who has risked his life many times to bring peace. Andrew White is wise and experienced enough to know that even as a Christian committed to acting as a peacemaker and Jesus’ teaching to love our enemies, when faced with an overwhelming tide of virulent hatred and evil, war is still a legitimate option. We have already seen and endured far too much – 129 dead in Paris, 43 in Beirut and 224 flying over Sinai, plus untold others in Iraq and Syria, all within the space of two weeks. The hope of defeating and eradicating ISIS is a hope for a more secure and stable world that needs to be acted upon. So what should the UK’s response be? Jeremy Corbyn’s refusal to give any situation where he would agree to lethal force being used may be based on principle, but as a leader in a real world with real terrorists and radical extremists killing real people, his reluctance to acknowledge the seriousness of the situation is neither helpful or welcome, nor is his decision to deny his MPs a free vote on air strikes in Syria. David Cameron admitted only on Monday that airstrikes ‘won’t transform the situation’ in Syria. However the following day he was beginning to prepare the ground for another vote holding the view that there is a very logical argument that if our parliament has sanctioned bombing targets in Iraq then not to extend them across a border that IS does not recognise is inconsistent. He may be right but his inconsistencies of approach undermine his case. He first proposed bombing President Assad’s military, but now by changing the target, Assad will undoubtedly benefit. The UK is only delivering around 5 per cent of the bombing sorties in Iraq, so how much difference would similar levels of intervention in Syria really make? We have committed ourselves to surveillance and deployment of Special Forces, which are potentially far more beneficial than a handful of bombing raids. The whole situation is a quagmire, with a multitude of pitfalls and unsavoury outcomes. We’ve made plenty of mistakes and displayed a lack of forethought in our previous involvement in Middle East conflicts and witnessed far greater subsequent instability realising too late that we can easily end up doing more long term damage than good. It’s therefore perfectly reasonable for the Foreign Affairs Committee to urge David Cameron not to press for a vote on Syria air strikes until a ‘coherent international strategy’ is in place. War is always a tragedy, which is why it must never be regarded lightly. Islamic State does not deserve to exist another day on this planet, but this is as much a battle against spiritual powers of darkness as physical ones. Political diplomacy and military strength from the skies will not be sufficient to overcome them. Maybe UK planes bombing a few of their sites in Syria will do some good or maybe it will simply increase their motivation to hit us hard on our own patch. It cannot be considered immoral if our parliament is finally persuaded to vote in favour, but unless we have a bigger and better strategy to destroy IS, recent history has indicated that it will do little to achieve the results we hope for.